E Liquid Mix Master Pro is an advanced E Liquid Mixing program with a Recipe and Flavor management system like no other. Designed from the ground up to make day to day mixing of e liquid easy, with enough features to make even the veteran mixer's mouth water. The design of this program was created specifically to be easy to understand for the non computer literate crowd. Most items in ELMixMasterPro have tool tips explaining what they do. Some of the more advanced features present instructions when the button is clicked. Create professional E Juice bottle labels with graphics. Automatic or On Demand new flavor scanning. 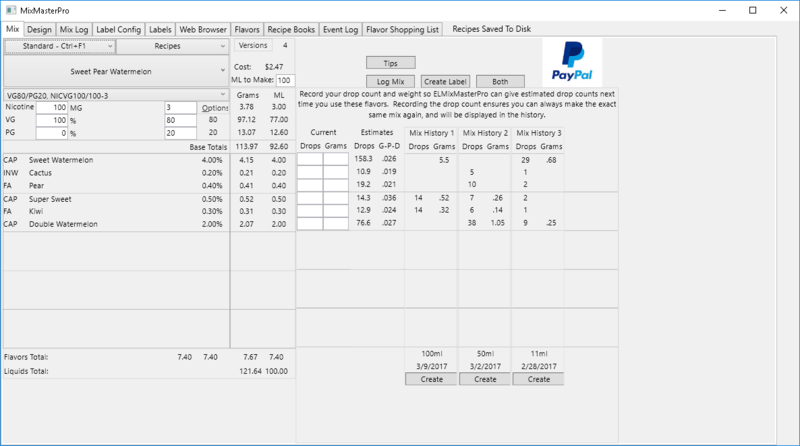 Currently 10 flavor manufacturers are scanned for new flavors daily. ELMixMasterPro can be configured to check the server for new flavors and alert you if new flavors are found. So why another e juice mixing program? I once had a dream of opening a vape shop, and wanted my own application for recipe and flavor management. Opening a vape shop is on hold, but I've decided to share my application with the world. I've cleaned it up a bit and added tool tips to help explain most of the features. Use it if you want. I'm still working on new features when time allows. My current project is adding flavor syncing with the server. My job has long hours and I'm away from the house 13-14 hours a day, and I sometimes would like to see if I have a flavor, or how much, from my phone while at work. You are welcome to use my application free of charge. You can probably figure out most features pretty easily, but I recommend checking out the printer label configuration before trying to print out labels. Check out the Features Overview. There are videos covering the features as well.